Another t-shirt design shown in Justice's D.A.N.C.E. music clip has escaped MTV heaven and made it to real chests. I was watching the clip for the millionth time yesterday, when 33 seconds into the video I spotted Bountee's "D.A.N.C.E" t-shirt. This is the latest entry to my tee-wishlist. This tee is from Concrete Hermit and sells for £25 ($49). Again, it's too expensive for me, but it would make a great addition to my t-shirt drawer. I'm a sucker for techno-nostalgia. 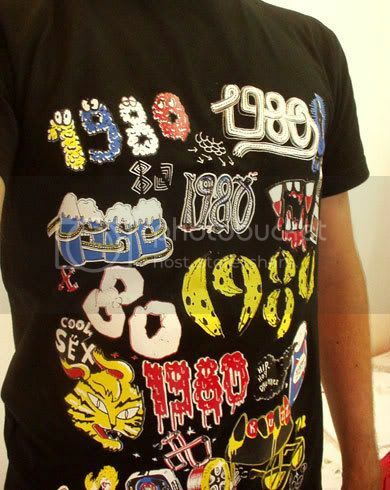 "Eighties" tee @ dadawan.com, on sale for €35 ($47). Too expensive for me, but I always like a tee that celebrates the 80's.